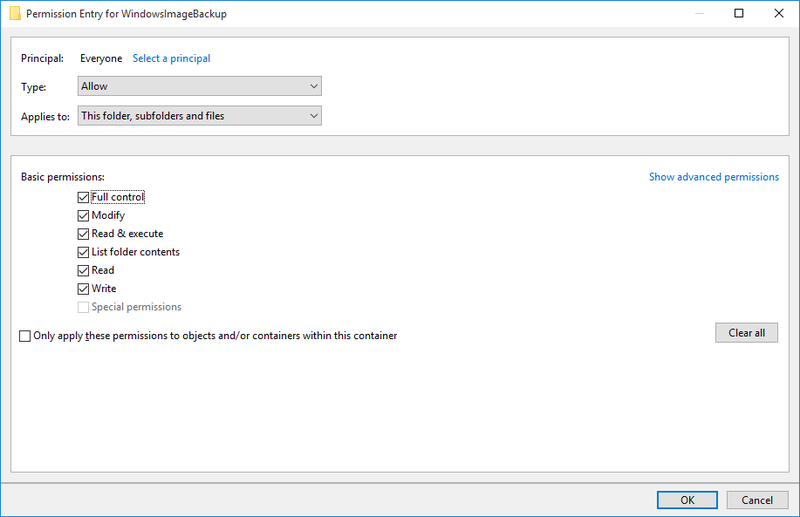 So you’ve made a Windows Image Backup – using the File History window in Windows 7, 8, or 10. Now you want to find out how large the backup is – so you right click and go to Properties, to find that somehow it’s…empty. If you wanted to take this huge folder and archive/compress it – you’re out of luck, because the various programs will not be able to enumerate the files in the subfolders. Very Frustrating. The truth is, the folder is not empty at all. In fact, this particular folder is roughly 350GB. So why does it say it’s empty? Because you don’t have read permissions over some of the subfolders, strangely. In this post, I’ll detail how, exactly, to give yourself those permissions. Right click the folder, click on Properties. Click on the Security tab. You’ll see it tell you that you don’t have Read permissions. Click on the Advanced button. You’ll see a screen that tells you once again that you can’t see your own backup files. Click “Continue”. You can see that there are a couple of different user accounts that have varying levels of access. Click the “Add” button”. In the resulting window, click “Select a principal”. In the “Select User or Group” window that pops up, type the word “Everyone” into the “Enter the object to select (examples)” dialog box, and click “Check Names”. Originally, the word “Everyone” will not have an underline, but after clicking “Check Names”, it should have an underline. Click “OK”. Back in the Permission Entry window, check off the “Full Control” permission, which should check off everything else on the list. Click “OK”. You should now see the “Everyone” entry in the “Permission entries” list. For some reason, there are other accounts added as well…but as long as “Everyone” is there, you should be good. Be sure to check off “Replace all child object permission entries with inheritable permission entries from this object” – it won’t necessarily help anything (because of the error below), but if you are occasionally able to apply these permissions to subfolders/files, you’ll save yourself from having to go through these steps a few times. Click “Apply”, then “OK”. If you get a popup explaining to you that “This will replace explicitly defined permissions…” just hit “Yes” – we do want to replace the existing permissions that lock you out of your own files. The first couple of times you do this process, you will run into an error that says “An error occurred while applying security information to: [your backup folder]. Failed to enumerate objects in the container. Access is denied.” This is the real mindfuck – you’re trying to give yourself permissions over a folder. That folder has subfolders, but your current user can’t actually see them all. You can’t see them all, because you don’t have permissions. So in trying to give yourself permissions, you can’t apply those permissions, because you can’t see them. So, you can’t have read permissions because you don’t have read permissions. Fun, right? No worries, it just means you have to do this same process a lot. Hit “Continue”, then click “OK” on the “Advanced Security Settings” window. Hit “OK” on the Properties window as well – this should leave all windows closed, except for Explorer. Now, you go one level deeper, entering the folder you just edited the permissions for, and start back at step one. Yay! Keep repeating the process until you’ve gotten through every folder and file. Below is a basic file structure that all of my backups match – hopefully yours matches the same basic structure. Good luck. WHO EVER MADE THIS GOT A SICK MIND. by the way,you got a nice sense of humor. Thanks a million!!! All this complication to backup to a NAS is such a mess. What were the creators of Windows Image Backup thinking. Please note that you do get an estimated size of the windowsimagebackup folder displayed to you just before you create it. At step 2 and 3 above if you take ownership of the folder(at top of images), you won’t have to click on every single file individually to change the permissions. Solution compliments of superuser user Tonny. 4. Click “Run as Administrator”. Thanks for taking the time to make this useful post!! I was able to unlock my damned WindowsImageBackup folder…SUPER annoying, right? ?